These blonde colored rose armchairs are distinguishable from other Ming period chairs in that the low back and armrests are at right angles to the seat. The struts on the back railing or stretcher which support the arch-shaped apron are bamboo shaped, with beaded carving in a scrolled decorative motif on the upper and lower aprons and spandrels. Arched aprons are also found under the armrests. The fine design and workmanship of these chairs are demonstrated in the size of the beading, the thickness of the wood used, the well fitted joinery, and the attractive color and wood grain pattern. 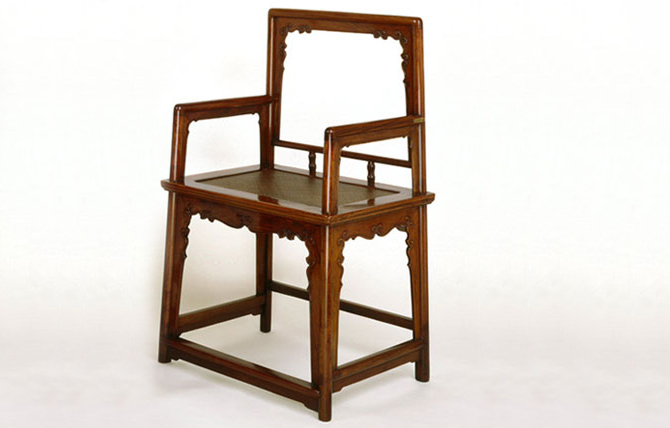 Similar chairs with different decorative elements and side railings are illustrated by Wang Shixiang, Classic Chinese Furniture, Plates 41 and 42. Dr. Sarah Handler writes in Ming Furniture In The Light of Chinese Architecture, pages 122 to 125: “The smallest Chinese armchairs with angular low backs, sometimes only slightly higher than the arms, are informal seats for both men and women. The top rail and arms are always straight and, as in the continuous yokeback armchair, do not protrude beyond the posts. 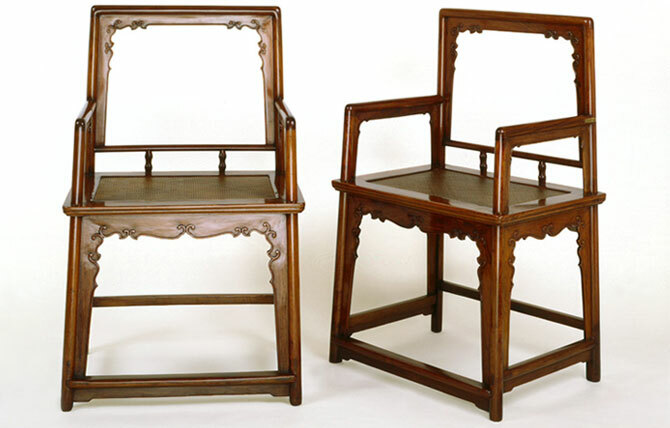 These are known as ‘rose chairs’ or meiguiyi in Beijing and, according to Wang Shixiang, they are ‘writing chairs’, or wenyi in Jiangsu and Zhejiang. This appellation is puzzling since the form and decoration of the chair bears no resemblance to a flower and the rose has no particular prestige or symbolic importance in China. Lowback armchairs are thought to have developed from a popular Song dynasty chair in which the back and arms are of the same height. This may be true; however, the paintings used to support this argument, despite their Song attributions, are generally considered by modern Western scholars to be Ming copies. A larger version of this lowback armchair with a separate mat backrest is shown in a thirteenth-century woodblock illustration to Tianzhu lingqian (Efficacious Charms from the Tianzhu).